Dear Aspirants, Today we are sharing e-book for English Vocabulary Barrons Mnemonics. This book contains Barron’s wordlist with mnemonics which makes it very easy learn and remember for long period. It is very useful for candidates who are preparing competitive exams like SSC, UPSC, SSC CGL, Bank Exams, GRE,IBPS, Clerk, PO, LIC AAO, Insurance exam, railway exam all type of competitive exams. 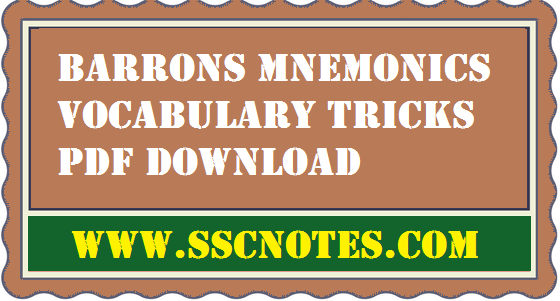 Candidates are advised to download Barron’s Mnemonics Vocabulary Trick pdf from a given link. barrons’ mnemonic dictionary download from the given link. gre barron mnemonics pdf will help to the GRE Preparation students also.